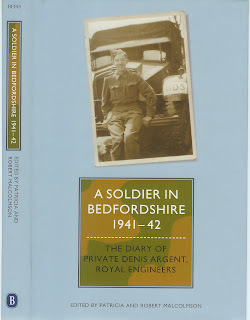 BHRS's 2009 volume A Soldier in Bedfordshire 1941-42 was launched at the Society's AGM in Bedford on 19 September. It is the diary written for Mass Observation by Denis Argent who was in a bomb disposal unit stationed in Bedford then Luton for a few months. Mass Observation, a social research organisation set up in the late 1930s to record 'how we were', relied on ordinary people to submit diaries and answer questionaires for its archive of everyday life. Denis Argent, who had been a journalist before joining up, took his diary very seriously and wrote about daily life as he saw it in Bedford and Luton. The diary is full of army routine, transport problems, politics, leisure, films, books, music and bomb disposal, including an account and pictures of digging up a bomb in Bedfordshire. Denis was also a conscientious objector at the beginning of the war and he writes a lot about how conchies viewed themselves. The book was launched with a lively presentation by Dorothy Sheridan, Development Director of the Mass Observation Archive and Bob and Patricia Malcolmson, who edited the diary for publication and who have edited several MO diaries. Sussex University hosts the MO Archive, which is very much an ongoing project - view its website to find out what is currently going on. The dairy is available from booksellers and the publisher, Boydell & Brewer at £25.